Established in 2013, CramdenTECH Ltd. draws together over 20 years of experience in corporate governance, business management, eLearning, training, instructional design, systems thinking and web development in one 21st Century company. 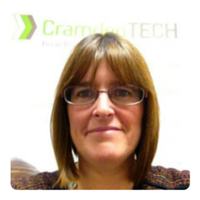 The CramdenTECH team is led by Managing Director, Caroline Egan. We deliver instructor-led training throughout the country year round and manage software development and eLearning services from our base in Shannon, County Clare, Ireland. “I can tell you the moment the seed for CramdenTECH was sown. It was a wet December night in 2012, sitting in my car waiting for traffic lights to turn green near Heuston Station, Dublin. I was returning from yet another training session, where corporate governance, compliance and risk management were the hot topics of conversation. Given the time pressures and budget constraints that people were facing, it struck me that there had to be an easier way for managers and directors of SMEs and Not-For-Profit organisations, to learn what they needed to know to effectively govern and manage. Traditional training methods can only go so far and reach so many. And that’s when I decided to find “a better way.” Three months later, the concept for www.cramdentechsolutions.com was taking shape. In April 2013 the company was incorporated and in June joined the Ennis Innovate programme. CramdenTECH’s innovative approach to board management was recognised early, as a finalist in the FBD Clare Business Excellence Awards categories of Start Up Business of the Year and Best Use of I.T. in Business categories in 2013 and 2014 respectively. This year, we have expanded our e-learning development services with the introduction of our content as a service (CAAS) Corporate Academy on micro-learning and MOOC platform www.buildfutureskills.com! CramdenTECH – Providing skills-based e-learning content for organisations in the Non-profit and SME sectors. We don’t simply provide instructional design or e-conversion services to clients, we work with them to achieve identifiable behaviour change and skills development in learners. More simply put, we help clients to ‘Map the Gap’!